To read the updated version of this article, visit www.jamasoftware.com/blog/defining-project-scope-context-use-case-diagrams/. 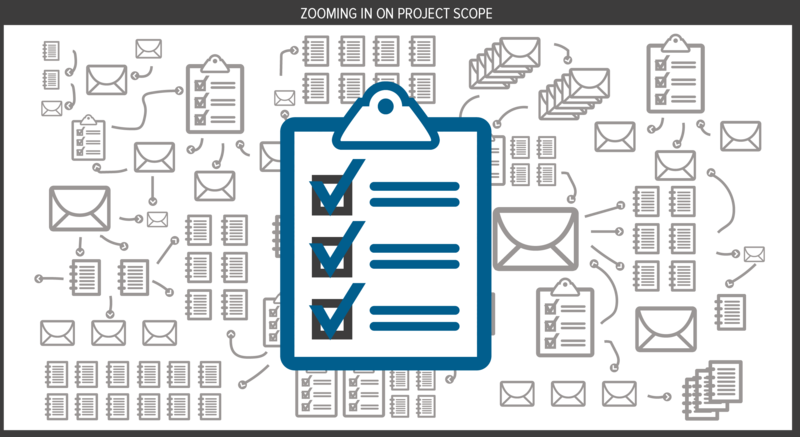 Every software team talks about project scope and team members often complain about unending scope creep. Unfortunately, the software industry lacks uniform definitions of these terms, and the requirements literature is short on clear guidance regarding how to even represent scope. I confront scope head-on in this series of three articles, adapted from my book More about Software Requirements (Microsoft Press, 2006). I’ll present some definitions, describe four techniques for defining project scope, and offer some tips for managing scope creep. I regard the vision and scope document is a key software project deliverable. You can find a suggested template for this document at http://www.processimpact.com/goodies.shtml. Other terms for this type of guiding document are a project charter, market (or marketing) requirements document, and business case. You don’t necessarily need a standalone vision and scope document for a small project. Any project of any size, though, will benefit from such strategic guidance, even if it’s just a paragraph or two at the beginning of the software requirements specification. Both the vision and the scope are components of the project’s business requirements. I think in terms of the product vision and the project scope. I define the product vision as: “A long-term strategic concept of the ultimate purpose and form of a new system.” The product vision could also describe the product’s positioning among its competition and in its market or operating environment. Chapter 5 of my book Software Requirements, 2nd Edition describes how to write a concise vision statement using a simple keyword template. I’ll define project scope as: “The portion of the ultimate product vision that the current project or iteration will address. The scope draws the boundary between what’s in and what’s out for the project.” The second part of the project scope definition is most important. The scope identifies what the product is and is not, what it will and won’t do, what it will and won’t contain. The rest of this article describes two techniques I’ve found useful for depicting project scope, the context diagram and the use case diagram. In part 2 of the series, I’ll describe two additional techniques, feature levels and system events. The context diagram depicts the project scope at a high level of abstraction. This diagram deliberately reveals nothing about the system internals: no information about functionality, architecture, or look-and-feel. Nor does it explicitly identify which features or functionality are in scope and which are not. The functional behavior of the system is merely implied by the labeled flows that connect the system to the external entities. Even the flows are labeled at a high level of abstraction, just to keep the diagram’s complexity manageable. The business analyst can decompose these data flows into individual data elements in the project’s data dictionary or data model. Corresponding data inputs and outputs imply the types of operations the system will perform, but these aren’t shown explicitly in the context diagram. Despite the limited view that the high level of abstraction imposes, the context diagram is a helpful representation of scope. It serves as a tool to help the project stakeholders communicate about what lies outside the system boundary. A BA in a requirements class I once taught showed me a context diagram for her current project. She had shown this diagram to the project manager. 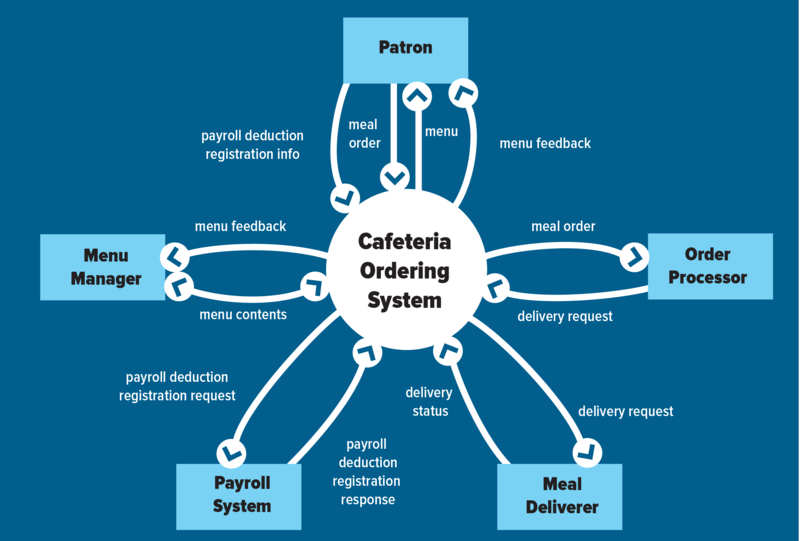 The manager had pointed out that one of the external entities shown on the context diagram, another information system, was now going to be part of the new system. With respect to Figure 1, this would be like moving the Payroll System inside the project circle. That is, the scope of the project just got larger than the BA expected. She had expected that external system to be someone else’s responsibility, but now it was her problem. The arrows on the use case diagram indicate which actors participate in each use case. In Figure 2, the arrow from the Patron to the oval labeled “Submit Feedback” means that the patron actor can initiate the Submit Feedback use case. The arrow from Submit Feedback to the Menu Manager actor indicates that the Menu Manager participates somehow in the execution of Submit Feedback. 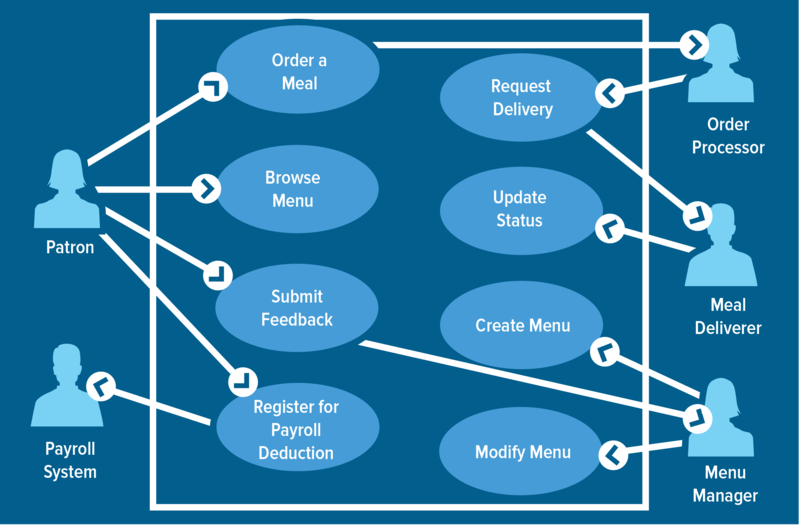 Arrows on the use case diagram do not indicate data flows as they do on the context diagram. Some analysts simply draw lines instead of arrows on the use case diagram to avoid any confusion with data flow. In addition to showing these connections to external actors, a use case diagram could depict logical relationships and dependencies between use cases.